Hi. I'm Spencer and I'm a Mormon Geek (waits for reply of "Hi, Spencer")... Oh that's not what this blog is for? Oh well. I guess I'll just get into introducing myself and then into the meat of things. I am a Mormon Geek and I'll be taking over your news feed on Tuesdays. 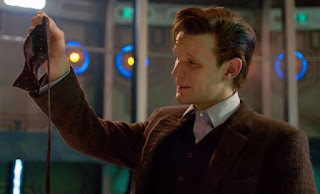 The things I geek out about vary, but right now I most geek out about Disney and Doctor Who (that one should be obvious from a guest post I did a while back). Anyway, enough of introductions. 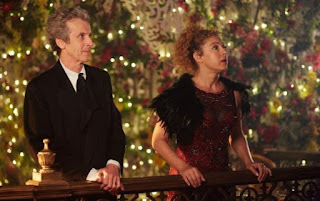 Time to get jolly with a Christmas-themed post. Like I said, one of the things I geek about is Disney. I can out-Disney most people I know. At my last job I actually made the claim to a coworker that I can work a Disney quote into any conversation (this is especially true of The Emperor's New Groove). 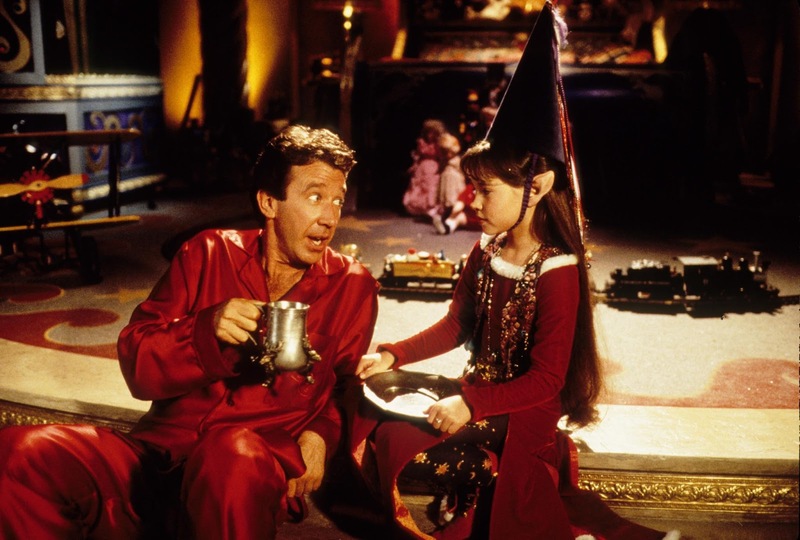 Today however, I'm gonna forego Disney Princesses and talking llamas in favor of something more timely: Disney Christmas specials and movies. Can't beat Mickey and friends right? I'll come right out and say that two of the three segments of is show are a bit cliche, but overall it's still a great show. We get Mickey and Minnie in a version of The Gift of the Magi, featuring them, Pluto, Figaro, Daisy, and Pete. It's heartwarming to say the least and definitely worth the watch. In another segment we get Huey, Dewey, and Louie causing all sorts of trouble for Uncle Donald on Christmas Day, only to make the clichéd wish that Christmas was everyday. 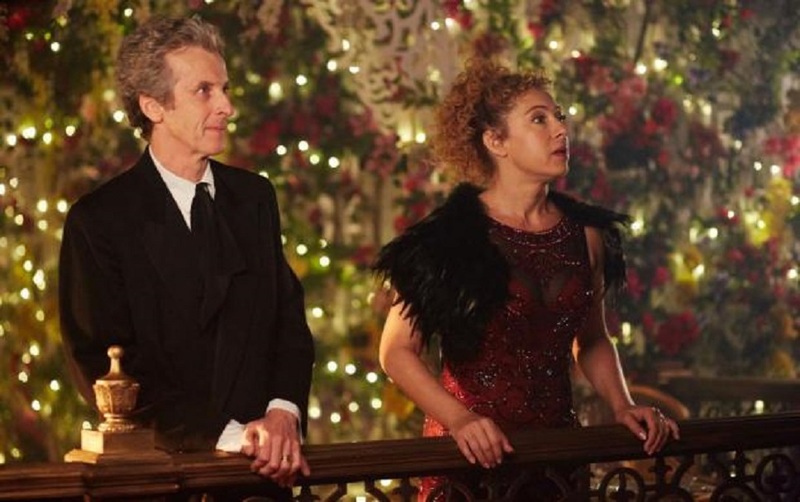 So mix that with Groundhog Day and you've got a recipe for disaster as the trio uses their repeating day to wreak some havoc without the consequences. Everything works out alright in the end, of course, and the trio learn to cherish Christmas. Finally, the third segment is Max and Goofy, both having their doubts in turn about Santa Claus. 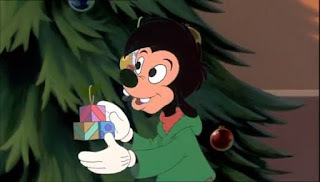 I liked his one for its uniqueness, however I take issue (probably because of the LDS view of faith) with both Max and Goofy trying to find proof to believe in Santa. Doesn't that defeat the purpose of faith? Overall, I liked this one. My only complaints are the clichés of Mickey and Donald's portions and the faith thing with Goofy's. If you don't over analyze these things like me, you'll be fine. I remember watching the House of Mouse when it was on tv (I think I was in middle school, so disregard the fact that it's supposed to be a kids show... Because I don't care). The cameos of all the Disney characters and little animated Mickey and friends shorts just makes this show amazing. Pure Disney Magic. 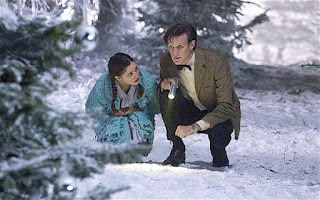 The Christmas special gives such a wonderful display of Disney Christmas shorts, perfect for any age. 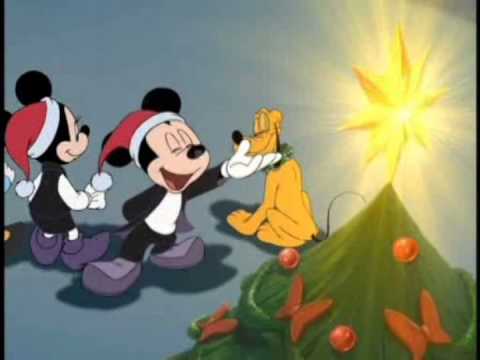 This show also includes the wonderfully classic Mickey's Christmas Carol. What better Scrooge than Scrooge McDuck? I remember him specifically from Duck Tales and there is definitely a reason he's named Scrooge. I love this rendition of Charles Dickens's story, accommodating for the personalities of each of our favorite Disney characters (nothing can beat Goofy as Jacob Marley). Just watch it. Ok? Good. Not a Disney classic by any means, but it is a must-view for me each year. We get some allusions to Christmas classics (Frosty the Snowman, for example) but we also get explicitly away from some other clichés (like the villain having a vendetta against Christmas). The thing I find most refreshing about this holiday special is that instead of being about Santa coming and delivering the presents and getting only his milk and cookies in return, Phineas, Ferb, and their friends go all out to show their gratitude for what they're getting. I think it's great to see a kids show promoting gratitude for what they get. I also really liked the concept that this show used to demonstrate nice kids vs naughty kids. Instead of being a good deeds vs misdeeds tally, they show at being good means being a good person with good intents and a good heart, because everyone makes mistakes. From a gospel standpoint, this is a soapbox of mine, the idea that we have to balance out our sins with our good works. That's not how it works. Just no. Nuh uh. Sorry. Period. I won't get on that soapbox here, but I'll just say that I like how the elves in this special explain it. The whole trilogy. I'm not a huge fan of the third movie, because, like most movie trilogies that weren't planned as trilogies, it gets weaker the longer you go. That being said, this is the perfect Christmas classic. It's unique. It's fun. It's funny. Alluding to my comments about faith from "Once Upon a Christmas", I really like how they dealt with her concept of faith in this movie. 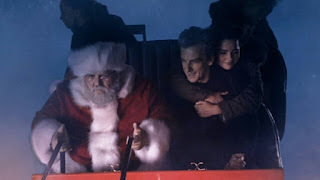 Though everyone was telling Charlie that his belief about his dad being Santa was crazy, he knew what he knew and it was because of his faith in his dad (not just in Santa) that helped his dad have the faith to be Santa. If not all three movies, I recommend at least watching the first movie in the trilogy this season. 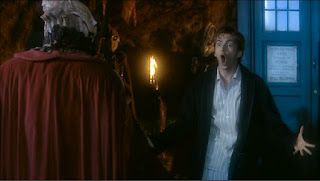 It's packed full of references to Christmas carols (eg. "Santa Claus is Coming to Town") and other Christmas traditions (eg. 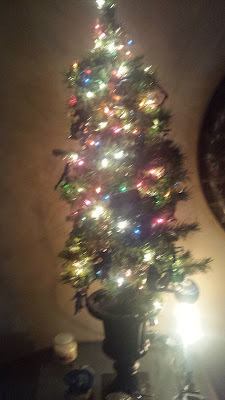 "'Twas the Night Before Christmas") and taking a look at those things from how a child views them (eg. The North Pole being a pole). It's full of childlike wonder which is amazingly refreshing during such a stressful time of year. Like I mentioned with Mickey's Christmas Carol, this is a fun way to enjoy Dickens's Christmas classic. 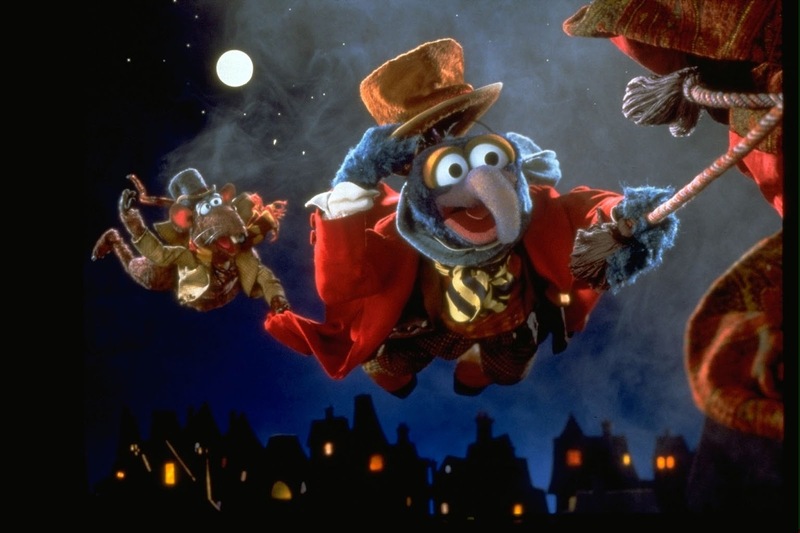 Gonzo (as Charles Dickens) and Rizzo give this movie the occasionally needed comedic timing, balancing out some of the darker parts of the show. Also, this movie has some amazing music. The Ghost of Christmas Present and the townspeople sing the song "It Feels Like Christmas" and I can't help but smile and be happy when I listen to it. 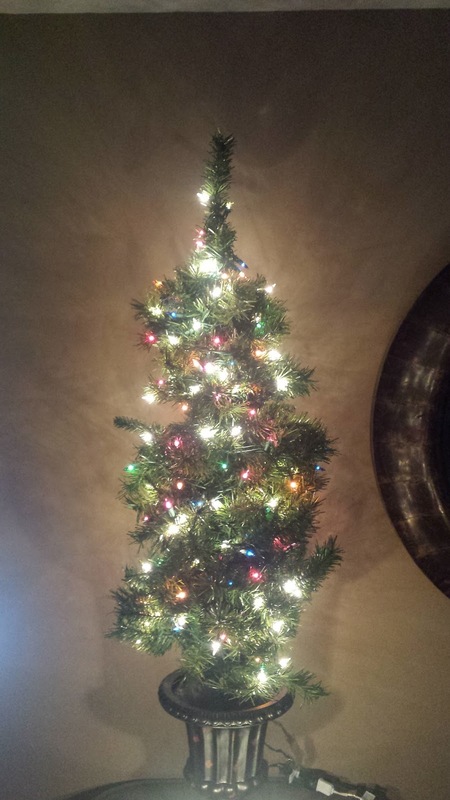 I think that song does an amazing job of capturing the feeling of Christmas. Finally, I have to mention how, like Mickey's Christmas Carol, this one does a great job of incorporating the Muppets' personalities into the characters of A Christmas Carol. 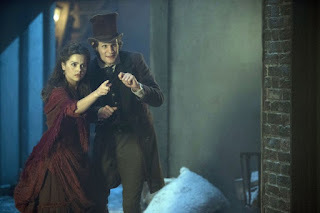 I especially loved seeing Miss Piggy as Emily Cratchit. You will never see a sassier Mrs. Cratchit. Also her two daughters, Belinda and Betina, are a chip off the old block. Love it! I know I said I'd forego Disney Princesses this post... Well, Belle is the exception (this will be even more true when Emma Watson plays her). This magical story takes place mostly in the middle of Beauty and the Beast. 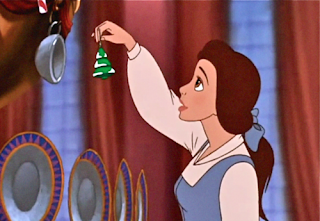 With the Beast having forbidden Christmas, Belle takes it upon herself to have Christmas anyway. The villain, Forte the Organ, is despicable and creepy. I probably hate him more than Gaston in the original movie. One wonderful theme of the movie is having hope and more specifically finding hope no matter the circumstances, like Belle did while she was a captive in the Beast's castle. Another perfect Christmas song appears in this movie as well. 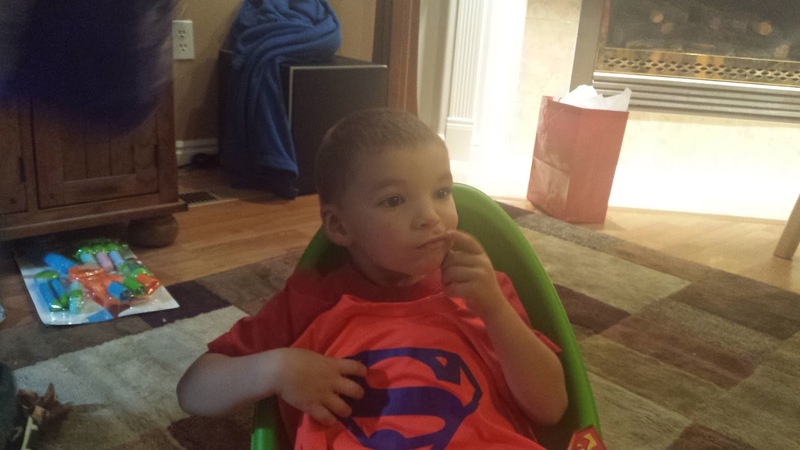 "As Long as There's Christmas" describes hope as the the best Christmas present we can give. Incidentally, as my roommate pointed out, hope was the first Christmas present. 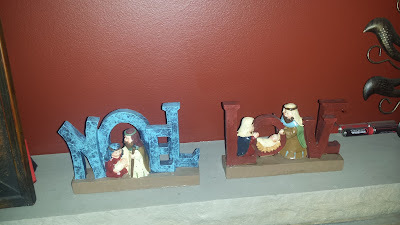 The Savior was born about 2000 years ago to give us hope of redemption from the Fall. Because of His Atonement, we have hope. That's all I have for Disney Christmas specials. 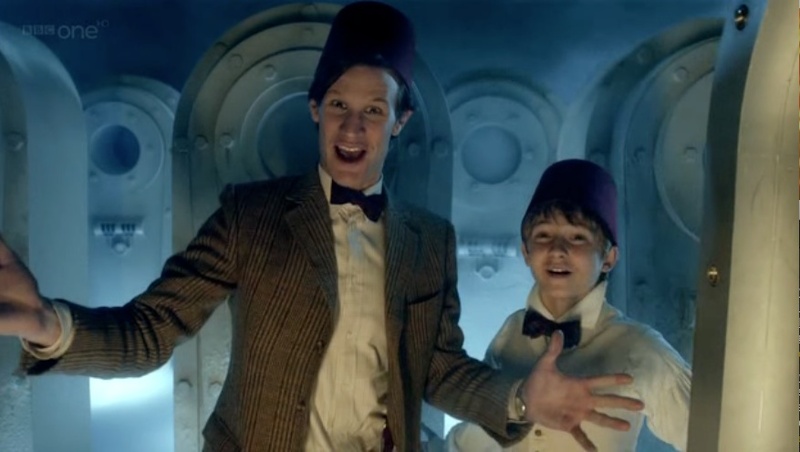 Next week I'll be back with the Doctor Who Christmas specials. In the meantime, what Christmas movies and specials do you watch every year (Disney or otherwise)? 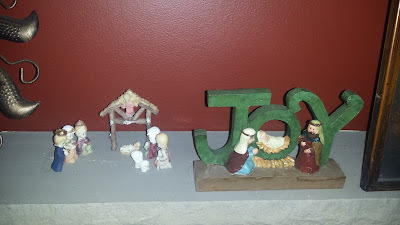 One of the Christmas traditions in my family is every year each of us receives a Hallmark Christmas ornament. Over the years, I've developed quite the collection of these ornaments. And many of the ornaments I've received cater to my geeky interests. 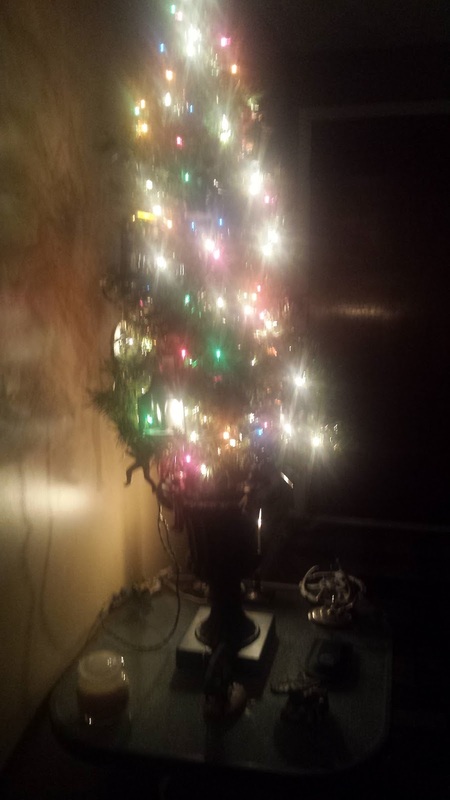 A few years ago, I purchased a small artificial Christmas tree. 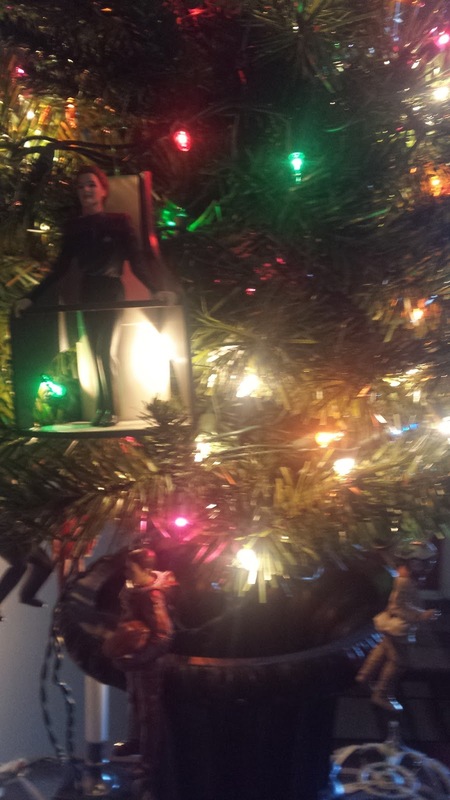 Unfortunately, due to its size, not all of my ornaments would fit on it. 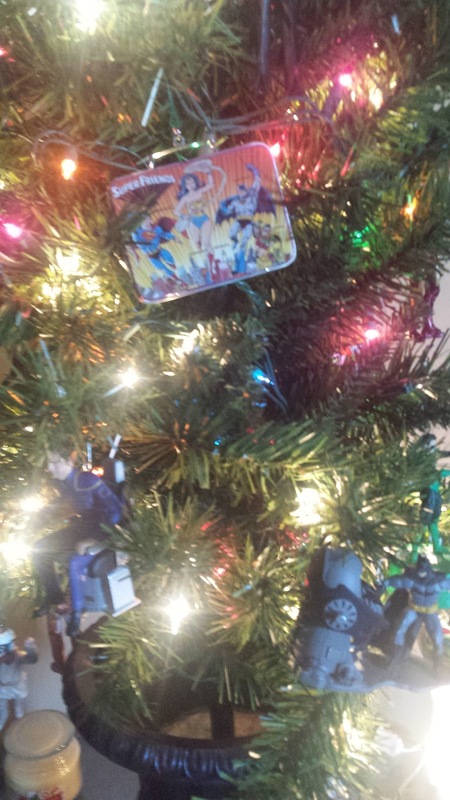 However, I found that there was still enough room to decorate my tree with a geek theme. The last two or three years, though I've put my tree out for Christmas, I haven't felt motivated to decorate it beyond the lights that came attached to the tree. But this year, I did feel motivated. 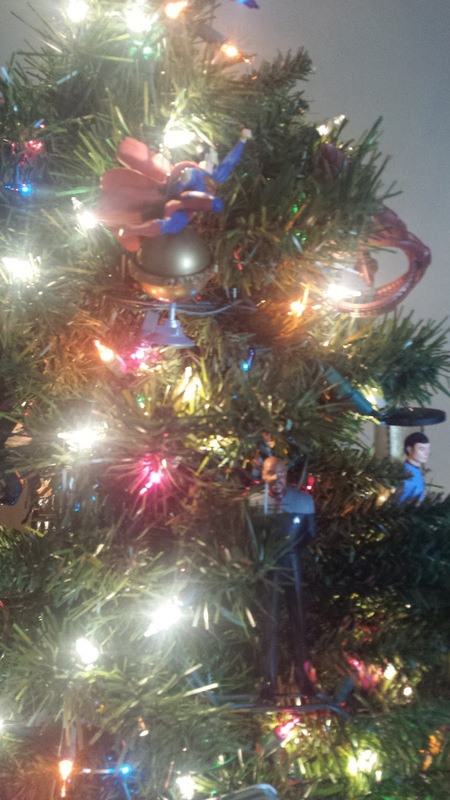 And so now my tree is up and decorated--geek style! More of the Star Wars theme and...yes, you guessed it--Star Trek theme! 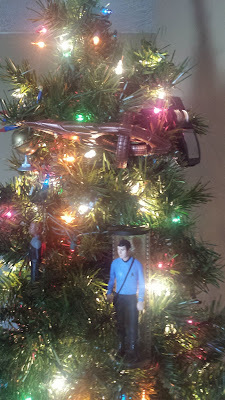 I also found that once I decorated my Christmas Tree with themes that matched my interests, I also felt motivated to continue decorating. So out came my ceramic Nativity set. 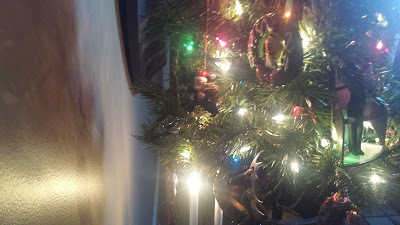 Stockings were hung over the fireplace. 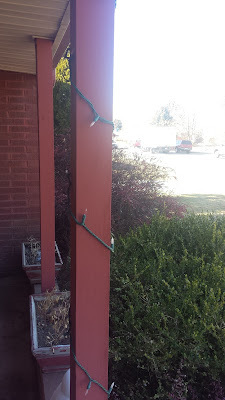 And for the first time, I also put up some outdoor Christmas lights. Though I am glad that I have some more traditional Christmas items that help me and others remember that Christmas is really about Christ, and I think it's important that these get put out as well, I'm quite pleased that anyone that looks at my tree can tell that I am a fan of Star Trek, Star Wars, Superman, Green Lantern, and the Avengers, just to name a few. 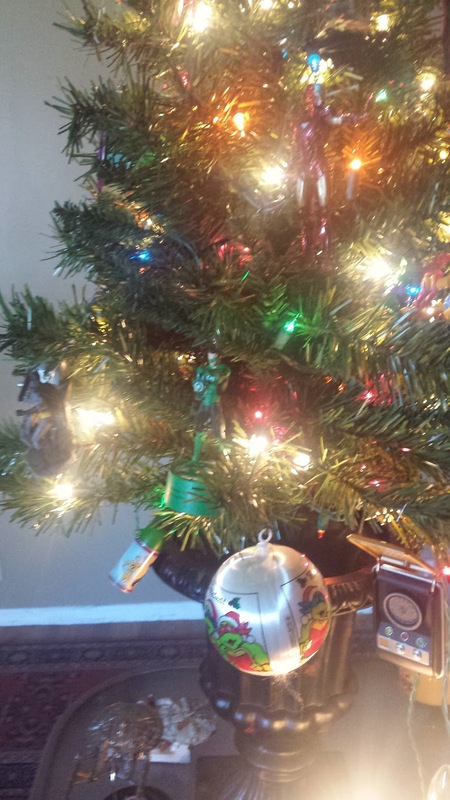 This is a geek's Christmas Tree! So with both my geek and traditional themes on display, I'm pleased to say that in my home, it's beginning to look a lot like Christmas! 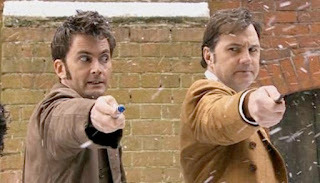 It probably comes as no surprise to anyone who reads this blog that I take pride in being a geek. While when I was younger, there were aspects of my geekiness that I kept hidden to avoid appearing weird to others, I am no longer ashamed of my interests. In fact, recently I was a volunteer staff member for a training experience for young men, in which older men that mentored these younger men were affectionately referred to as “weird uncles.” Although I am not old enough to be an uncle to most of these young men (as most of them were in the age range of my younger brothers), after a bit of thought, I realized that I am a weird uncle to my own nieces and nephews, and it is a title I claim with joy. When my first nephew was born, I tended to give him gifts that were more mainstream. 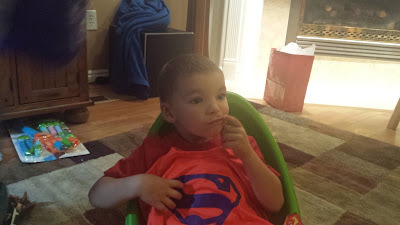 I didn’t want to give him something I would have liked if he wasn’t likely to enjoy it. Though over time, and as more of my nieces and nephews joined the family, I found that I could find a balance between the two. I could still be the weird uncle that gave geeky gifts, though I could also do my best to make sure they were gifts that my nieces and nephews would also enjoy. 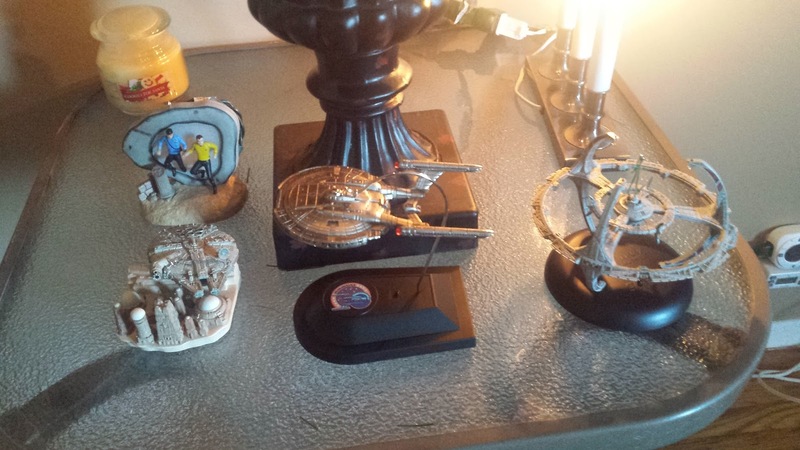 And I’m definitely starting to see that my nieces and nephews have their own geek interests. My oldest nephew is really into Minecraft and likes Avatar: the Last Airbender (even dressing as Avatar Aang for Halloween once). 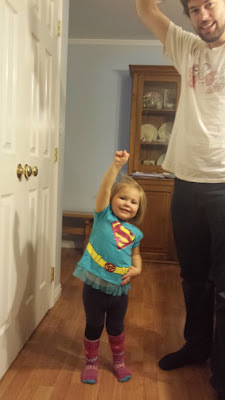 The oldest of my nieces has developed an interest in superheroes (due in no small part to the influence of her dad), and whose favorite superhero is the Flash. 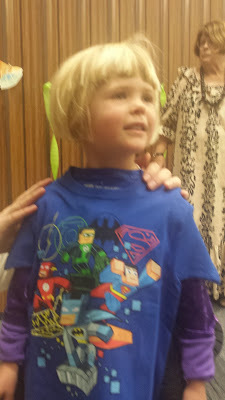 When she was only four years old, I can recall her correctly naming all the characters on a Justice League t-shirt I was wearing. 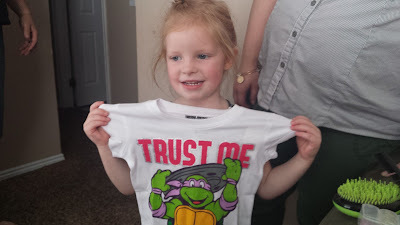 Another of my nieces is a big fan of Teenage Mutant Ninja Turtles. I have often found her watching the latest TMNT cartoon series, and take an immediate interest to anything turtle related. While some of my nieces and nephews are still too young for me to have noticed any particular interests yet, I no longer shy away from giving them geeky gifts. I will still get gifts that I believe fit their personalities and see if doing so might pique their interest in something new. If they don’t take a particular interest in that, I always have the opportunity to try something different the next time. I have found that my gifts to my nieces and nephews (and to others as well) not only gives me the opportunity to express my geeky nature and be a weird uncle to them, but also gives me a chance to relate to them around common interests. 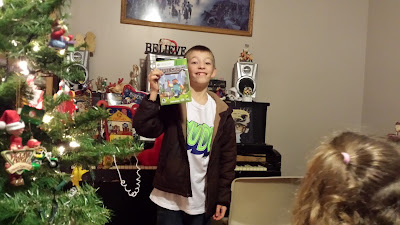 I have had many a discussion around Minecraft, the Justice League and Teenage Mutant Ninja Turtles with them. Although they are still young, it’s fun to see them begin to get into some of the fandoms that I have loved for years, and find their own interests that they may come to enjoy and love for years to come. Last week, the latest live action television adaptation of a DC Comics character aired on CBS. This new series, developed in part by producers of Arrow and The Flash, Greg Berlanti and Andrew Kreisberg, adds a lead female protagonist to DC's current line-up, with Melissa Benoist cast as the title character. 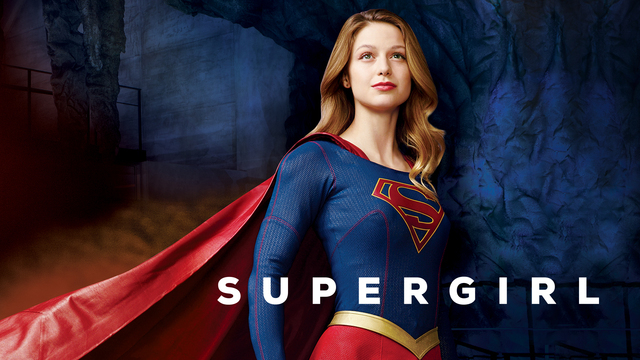 This new series is Supergirl. A few months back, when I saw the trailer advertising this series, I was intrigued by it, in particular because it was introducing Supergirl into a universe where Superman not only already existed, and was already well established, but was doing so without actually introducing Superman. The trailer created a lot of excitement and hype for this new series. 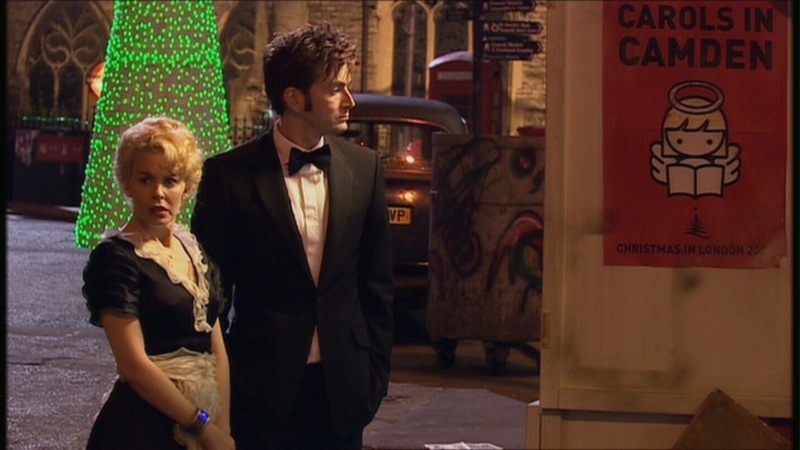 Unfortunately, at least for me, the series pilot, while having some great moments, did not live up to that hype as a whole. Much like the Green Lantern movie that was released about four years ago, I see the pilot for Supergirl as decent, though not particularly impressive, but due to the expectations the advertising beforehand set up for it, made it come off as a let down. Though the actress cast as Supergirl definitely has the look for the part, she doesn't have the characterization of Supergirl that I've seen portrayed in the comic books over the last ten years. Whether this is due to how Benoist interprets the character, is do to the fact that the character in the TV series is in her mid-twenties rather than in her teens as the comic book character is, or that the writers were going another direction with her, this is not the Supergirl that has been seen at least since the character was killed off in the comic books in the mid-eighties. As mentioned earlier, Superman is well established on Earth when Kara arrives. The problem I see is that in the beginning of the episode, Kara is thirteen years old. The episode then jumps to 11 years later. This would put a Superman that was already well established when Kara was a teenager likely into middle age by the time Kara decides to take on the role of a hero. 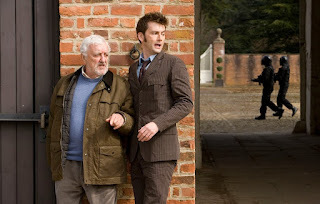 Is the Superman of this show beginning to show his age? And is that the real reason that his face is never shown? 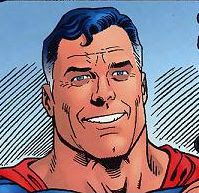 Granted, a middle-aged Superman could still work (it's something we've seen with some versions of the Earth-2 Superman, as well as with the Kingdom Come Superman). The problem I see is that the writers of this episode would like to do crossovers with Arrow and The Flash, which would place Supergirl in the Arrowverse. The way civilians react to vigilantes, superheroes and meta-humans in Arrow and The Flash, I have a difficult time believing that this could be the same world where Superman has been around for over ten years. It just doesn't fit. Without giving away any major spoilers, I will also say that the role that Kara's adopted sister is revealed to play in this episode (and will apparently continue to play through the season, and possibly the series) feels too convenient. It comes off as rather contrived, and nothing more than a plot device to get Kara involved with other characters. One thing that doesn't make sense (and this is true of many Superman origin stories as well) is why she wears glasses. After she takes on the superhero identity of Supergirl, they make sense. 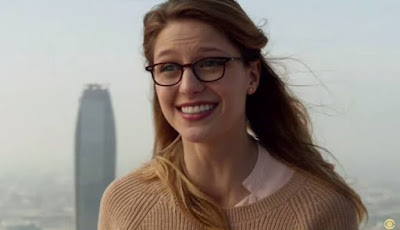 But when she had no intention of ever taking on a superhero identity, why would a Kryptonian, with superhuman vision, be wearing glasses? It's definitely not about fashion, as Kara is clearly depicted to be fashionably inept. So what's the point in wearing them? Lest this turn into nothing more than a rant of everything that was wrong with the pilot episode of Supergirl, there were some things I definitely liked about it. Kara's adopted human parents are played by Dean Cain (who played Superman in Lois & Clark: the New Adventures of Superman) and Helen Slater (who played the title character in the 1980s Supergirl movie). I appreciated this nod to the previous material. I liked how it carries on the tradition started in The Flash with casting John Wesley Shipp (who played the Flash in the 90s Flash TV series) as Henry Allen, as well as bringing back Amanda Pays and Mark Hamill to reprise their roles as Dr. Tina McGee and the Trickster that they played in the previous series. I also like the continuing tradition of bringing in characters from the ensemble cast from the comic books. Some, like Cat Grant, are portrayed in a very similar way as they have been in the comic books. Others, like James (Jimmy) Olsen, are portrayed very differently. While still others, such as Hank Henshaw, still remain to be seen. Choosing to use Kara as her name in her civilian identity is also an interesting choice. Originally I was opposed to it, as it the character in the comic books has almost always gone by Linda in her civilian identity. But when I think about it, if she had grown up never intending to be a hero or take on another identity, why would she not use the name she had gone by throughout her life? Going by Kara in her everyday life makes sense. Again, without giving major spoilers, I found the apparent source of the villains that Supergirl is apparently being set up to fight this season intriguing. 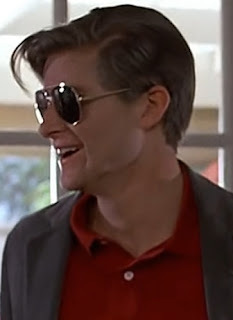 It's definitely more refreshing than the Smallville villain of the week that received his or her powers from exposure to Kryptonite, or even the improvement of the villain of the week meta-human created by the particle accelerator explosion typically used in the first season of The Flash. That being said, I hope that they go beyond just the villain of the week formula, though I am interested in seeing where they go with this. I also like that Superman can be casually mentioned in the series without ever really being fully shown. It's a reminder of Kara's history and culture, while reminding us that she is not her cousin. I will say, however, there is a line of talking about him too much. 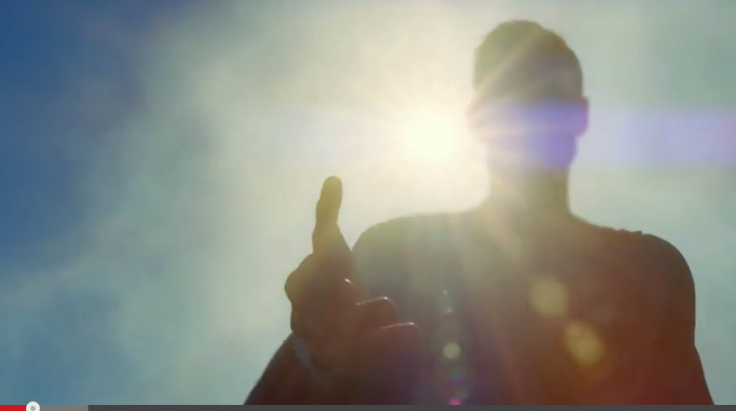 As this was the pilot, and an origin story, I'll give the numerous mentions of Kara being Superman's cousin a pass, though in the future, I hope that this will be more balanced, as talking about him too much (even without him being seen) takes the focus away from the characters in this series. And finally, I do like Supergirl's costume. It is more styled after the classic costume. And as Kara is trying different styles, they even poke fun at the bare midriff style of costume that has been seen in more recent years in the Supergirl comics. The costume that Supergirl ultimately goes with is a good fit for Kara's personality. I do intend to continue watching Supergirl, and seeing where the show-runners take this series. However, I cannot say that I am excitedly waiting for the next episode in the same way that I was watching the first seasons of both Arrow and The Flash. This series still has a lot of potential, and I hope to see it reach the same level as I've come to expect for a live action TV series that depicts DC Comics characters. 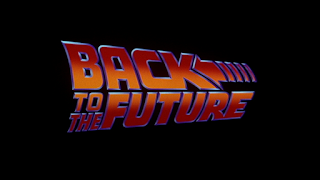 Thirty years ago, a science fiction movie was released that was based around a DeLorean that was turned into a time machine that could traverse the space time continuum when it reached 88 miles per hour. 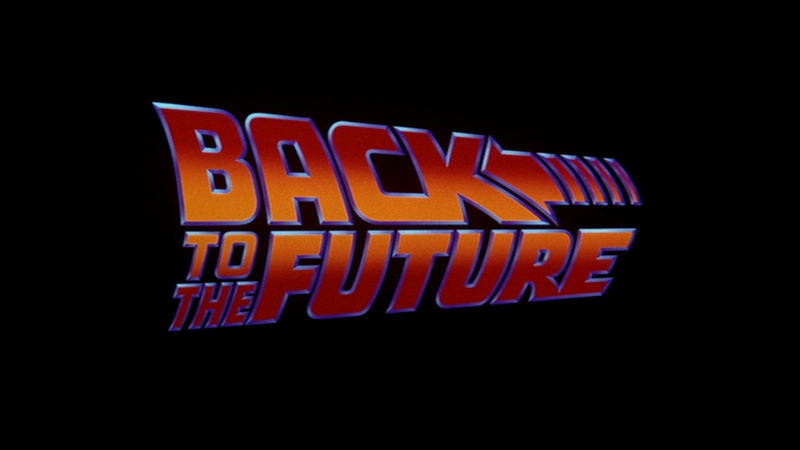 This movie, whose script was originally rejected by a number of major film studios for not being risque enough, and was also rejected by Disney due to a plot element of a mother falling in love with her time traveling teenage son from the future, and was eventually picked up and produced by Steven Spielberg. 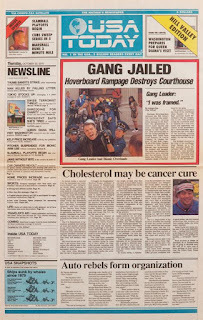 As I'm sure you're aware (especially if you read Joe's post from earlier this week), this movie was “Back to the Future.” This movie became the top grossing movie of 1985, quickly became a cult classic, and later spawned two sequels. In the first of these sequels, the main characters, Marty and Doc Brown travel thirty years into the future. 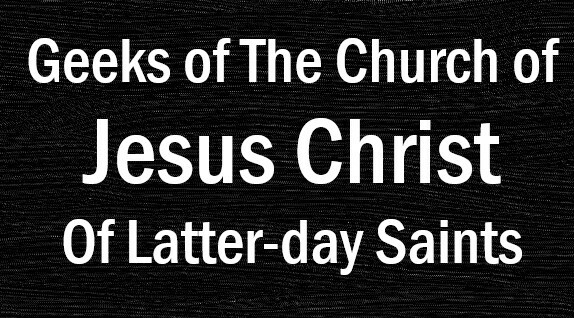 For the past couple of years, there has been a countdown clock that has been featured on the side of the Mormon Geeks website. This clock has been counting down the time until the future date depicted in Back to the Future Part II, which occurred two days ago on October 21, 2015. I'd like to discuss the day after that, October 22, 2015, which was yesterday. In Back to the Future Part II, after bringing him to 2015, Doc shows Marty a newspaper headline from the following day (which he obtained before picking up Marty from 1985 and then returning a day earlier), which shows that Marty's son was arrested for taking part in a theft. Then, of course, they execute a plan in which Marty briefly replaces his son, who looks identical to him (both are played by Michael J. Fox, after all), and prevents him from getting bullied into participating in the theft that resulted in his arrest. 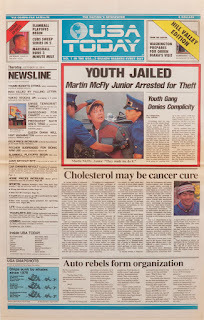 After Marty prevents the theft, the headline changes to show the gang of bullies that attempted to coerce him into being involved with the theft have been arrested instead for vandalism and destruction of public property. This part of the movie also shows that one small choice can make a big difference in future consequences. 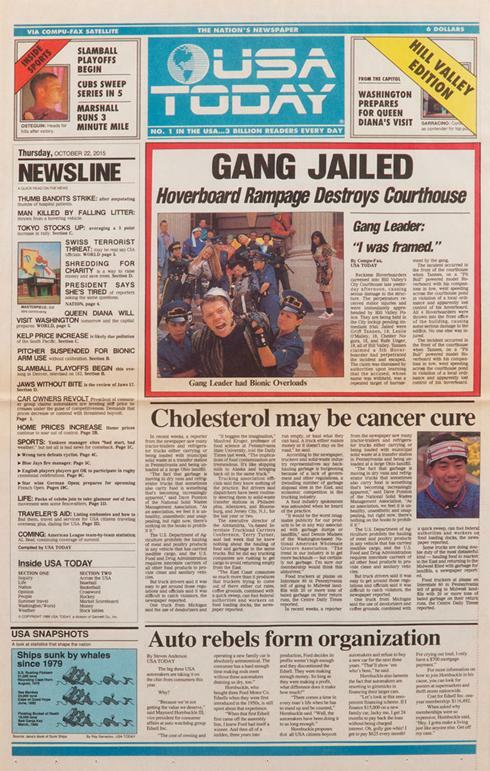 Yesterday, USA Today published a replica of the newspaper headline that appeared in the movie, in commemoration of Back to the Future Part II. Yesterday also marked an exciting event that occurred in my family. 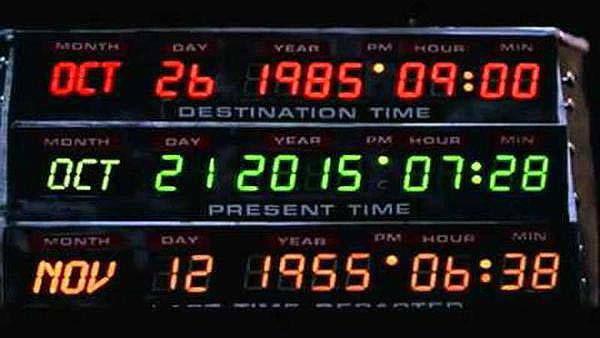 As this is the same date as shown on the newspaper in the movie, I was doubly excited. 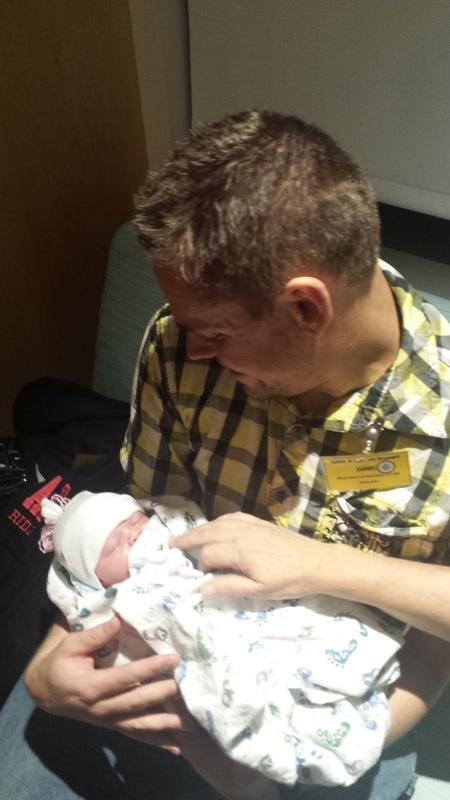 On October 22, 2015, at 7:23 PM, my niece, Alexis, was born. Alhough I was probably much more excited about the link to the date on the newspaper shown in the movie than her parents (who were much more focused on the new addition to their family), my brother (her father), who also grew up watching the Back to the Future movies with me, definitely got a kick out of the connection. I've already been encouraging my nieces and nephews in developing their geeky interests. I have a history of buying them birthday and Christmas gifts with geed-related themes (granted, at times I'm just sharing my own interests with them, in hopes that they will develop an interest as well, but as we are not short of geeks in my family, they get just as much encouragement from their parents and other aunts and uncles). We have all been given the gift of agency by a loving God, and that includes choosing how to live our lives. The choices we make today will determine the kind of person we will become in the future. Just as George McFly went from cowering before Biff, being intimidated and living small as shown in the original timeline shown in Back to the Future, to becoming confident, believing in himself and becoming a successful author due to Marty's influence on a couple of choices he made in the past, the same is also true for us. 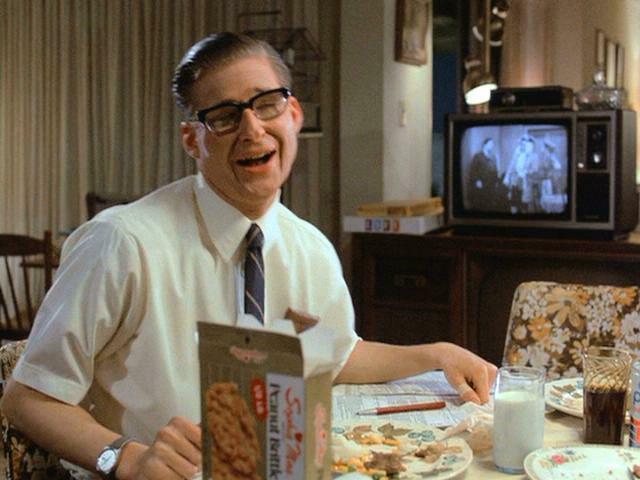 As Back to the Future taught us, seemingly small choices can have large impacts on our future. So in closing, I hope that we all will remember that the future truly is what we make of it, and encourage each of us to use the gift of agency to make it a good one.